Good morning sweet friends! I hope you are enjoying every bit of the magnificent weather that comes with the change of season. Yes, what a time to be outside! I’ve kept my hands busy these past couple of weeks, I’ve been designing new dies and can hardly contain my excitement over what comes next. The weeks are whipping by and every week I look up to see it is Friday again! Today I’m sharing a new card with a new Quietfire Design sentiment that really resonates with me. I imagine it will mean different things to different people and I’m also sure that at some time in your life you’ve landed on a ‘moment full of you’ where you’re flooded with thoughts of a distant friend, a far away family member, an old love, someone who has passed on. I decided to frame my card on two blue panels cut with Spellbinders A2 Curved Borders Two – the two panels meet in the middle vertically. On top of the panel I added Spellbinders Heirloom Oval on top being sure to cut out the center to form the cream frame. I cut the inside of the Heirloom Oval again from blue so that I had cover for my ribbon that spans the card and to have a nice place to stamp a sentiment. Lastly I decorated with a couple of my favorite Spellbinders Cinch and Go Flowers. For new readers, every Friday it’s my pleasure to give away a card. The card goes to a randomly picked reader (worldwide) who leaves a comment in our conversation. Want to know more about Day of Giving, here’s a link to my FAQ’s just check out #11. You can check to see if your name is on the list of winners HERE – our winners list is up to date! For your comment: When was your last “moment full of you”. 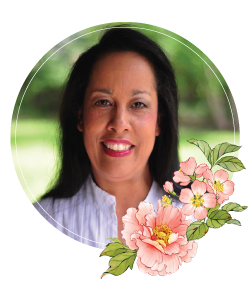 Accessories: Spellbinders A2 Curved Borders Two, Spellbinders Heirloom Oval, Spellbinders Cinch and Go Flowers, Offray Satin Ribbon Sending you many blessings! As always, I so appreciate your support sweet friends! Just knowing you all and reading your sweet words is an absolute joy and highlight in my life – you lift me up!! Yesterday was full of moments of you, as so many people wished me Birthday Wishes, so I was gladly full of memories that brought joy to my heart by remembering all of the truly good family and friends that I have! Good morning Becca, another beautiful card anyone would love to receive!!! Gorgeous, Gorgeous, Gorgeous!!! Last week on my granddaughter’s birthday, I know my beloved George told me to wake up because I was missing Evie’s face opening her present’s. Bless that man. Becca you are truly blessed as are we being able to visit your blog!!! A very beautiful calming card . I can not think of anything at the moment Becca i have had a very traumatic year so far ,i just hope and pray all ends well . What a lovely card, Becca. The blue and cream are gorgeous together. The sentiment is unusual, too. When I first read it, I thought of how we often think of dear loved ones who have passed away. But in your last paragraph you challenge us to apply the idea to ourselves and I find this much more difficult. I don’t have many “moments full of me”. Becca, I love this card & one of my favorite colors is blue. Hi Becca, so exciting to hear you have new dies in the works. Can’t wait to see your beautiful new designs. My moment would have been last night when I was looking at my kids, how fast they have grown up! It seems only moments ago they were babies. What a stunning card Becca. Love the colors and your bow is awesome. I have all the dies, even the cinch and go, so I’ll be giving this card a try soon. Reading the sentiment on your beautiful card brought tears to my eyes! As I packed for our holiday yesterday, I put in my mother’s cross and a scarf my aunt gave me many years ago and the memories came flooding back! New dies! How exciting Becca! Can’t wait! I should you have inspired me to get them out again! and we are blessed !!! inspiration as there are many weddings in our part of the world coming up!!! 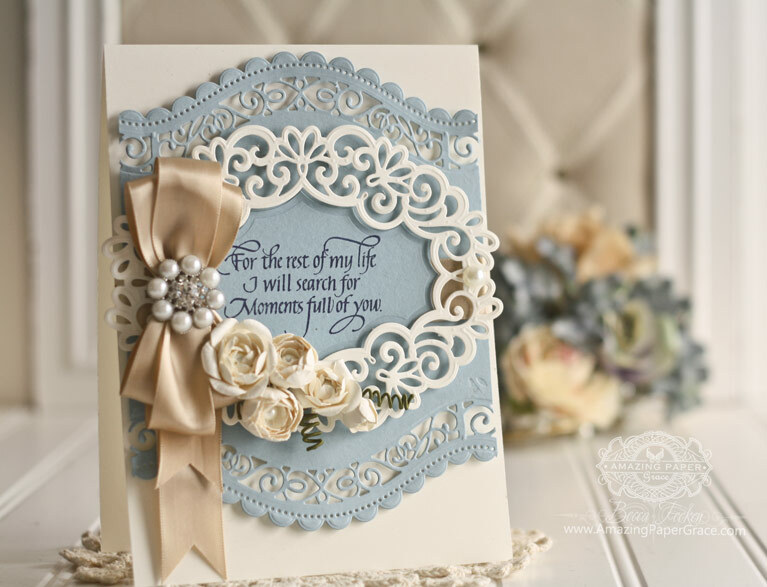 Lovely colors and details on your beautiful card! 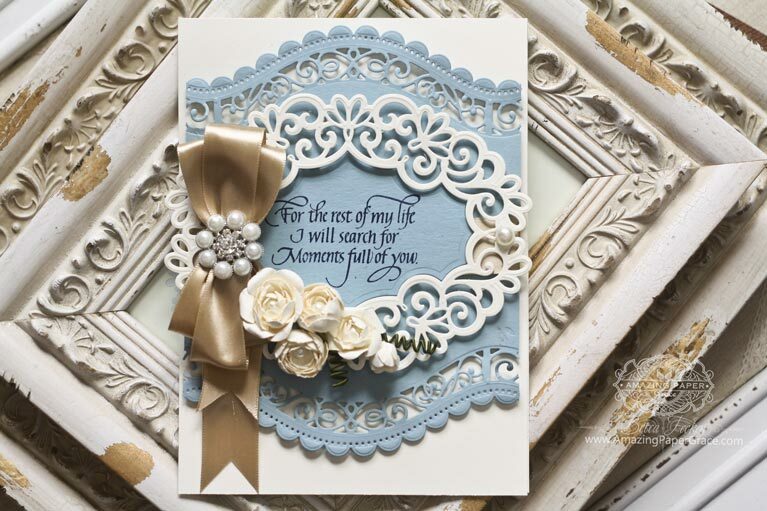 A beautiful card with such a poignant sentiment. However turning it towards myself I had a birthday recently and it certainly became a day where everyone made it ‘full of me’. Look forward to hearing and seeing more of your new designs. Congratulations. What a truly beautiful card and sentiment. My “Full of you” moment was last Saturday at my Golden Wedding Anniversary. I looked for my mother and father as they would have been so proud of us. 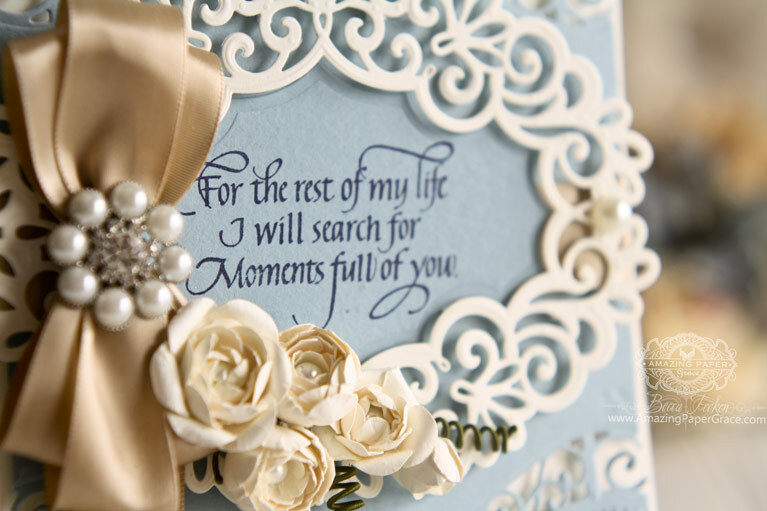 Hi Becca, A very stunning, gorgeous colours, gorgeous die cuts and flowers and a very gorgeous sentiment !! The last ‘moment of me’ was a couple of weekends ago when I went to a Craft Show and spent far too much money haha (as always), but the items I bought were all for using for other people. I absolutely love this set of dies u used for the card today. Just before vacation I did a “me” day – hair nails toes the works. That only happens about once a year. Rest of time I do for others. Hope u got my birthday card and that I had a lovely day. BEAUTIFUL card Becca!!!! You always warm my heart with your cards! Have to say yesterday was an example,of ‘full of me day’….learned at 11am, we needed to get a king size bed moved out of our bedroom so a hospital bed could be moved in. Unfortunately the people who bring in and set up the hospital bed do NOT take out any existing furniture. The bed could not be ordered until the king bed was out of the room. I had a call two days ago from neighbors who had heard about Jim and actually go to my church (big church 3 services) offering any help I might need. As the only person I knew in my neighborhood not working was away from his phone, I called them. The couple came down in a 1/2 hour…as well as the neighbor I had left the message with, and we managed to get the king bed into the garage – definitely an immediate answer to a desperate prayer on my part. Hospital bed delivered and set up at 5 pm same day! Sooooo GRATEFUL! Becca, this card brought tears to my eyes. Such a lovely card with such a wonderful sentiment. I have been following you for so many years Becca and all I can say is that John was a lucky man. Your card today is full of elegance and beauty. I love the Borders Two dies and how you’ve used them here. Beautiful, love the message, colour and design.